The night before the Muslim holy month of Ramadan began, the Syrian army was mobilised and deployed, not to the occupied Golan Heights, but to Syrian cities and villages. The brunt of this campaign of state-sponsored violence was absorbed, yet again, by the defiant city of Hama. In 1982, President Bashar al-Assad’s father brutally crushed an armed insurrection by the Muslim Brotherhood there, killing more than 20,000 Syrian citizens along the way. Today the Syrian army continues a tradition of fostering instability in the country, first started in 1949 when the eccentric General Husni al-Zaim (with the help of the CIA) used the Syrian army to topple the country’s first democratic government after independence. Ironically, 1 August is called Armed Forces Day – a day when Syrians can celebrate the institution that is supposed to protect them. Many analysts argue that the Assad regime has made a desperate attempt to crush the uprising prior to the holy month of Ramadan, when prayers held every evening in mosques throughout the country are expected to increase the frequency and intensity of protests – but I don’t think so. I think this regime has deliberately and intentionally bloodied the nose of the Syrian people on the eve of this holy month. By now, only the most deluded of Assad’s circle of close advisers would think that the Syrian uprising can ever be crushed. The start of Ramadan should be seen as the beginning of a war of attrition by the regime against the Syrian people, similar to the situation in Libya. Already there are smatterings about the formation of a “Free Syrian army” which, if it exists, will mean the country is entering an even bloodier stage. Yet the Syrian protesters have, in spite of fantastic stories about saboteurs and Salafist terrorists by the regime’s media, remained overwhelmingly peaceful in their protests. 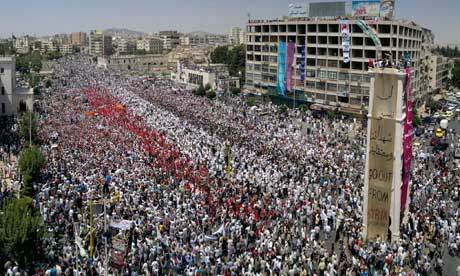 In the weeks preceding the recent crackdown, Hama witnessed some of the biggest demonstrations in the country with almost no loss of life – attributed to the fact that the Syrian security forces were withdrawn from the city. But it seems that the regime is intent on provoking a violent reaction; the arrest and humiliation of an important tribal chief over the weekend was seen as a deliberate provocation, with one spokesman for the al-Baggara tribe telling al-Jazeera Arabic that “the peaceful nature of the protests will be considered over” if their chieftain is not released immediately. It seems to me that those in Assad’s circle who thought they could defuse the situation with minimal violence (I abhor labelling them as moderates) have been drowned out by the more hardline elements. In the end, Syria has gone down the road of Libya, not that of Tunisia or Egypt. As with Muammar Gaddafi, Assad seems to have realised that once the Syrian people broke through the fear barrier, his fall from power would be inevitable. As a result, I have no doubt that the regime now intends to pursue a ferocious campaign against the people who dared to rise up against it. In the meantime, an elaborate and extensive international network of lawyers, lobbyists, statesmen and governments will be probably be utilised to stretch out the regime’s existence for as long as possible. Whether it was Saddam Hussein or Gaddafi, it seems as if all Arab dictators have spent the decades of their rule, apart from plundering their countries, also ensuring their dominions would self-destruct should they ever be ousted from power, as an additional bolster to their eternal rule – Après moi, le deluge! I fear that when Assad is finally ousted from power, Syria will be left a smouldering wreck.